Anna Kelton Wiley was born in Oakland, California in 1877. She graduated from George Washington University, Washington, DC, in 1897 and worked in various government offices. She married Dr. Harvey W. Wiley, Chief of the Bureau of Chemistry, in 1911; they had two children, Harvey, Jr. and John P.
Source: Doris Stevens, Jailed for Freedom (New York: Boni and Liveright, 1920), 370. 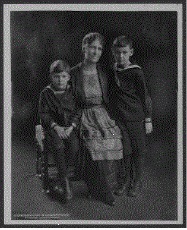 Photo Source: Studio portrait of Anna Kelton Wiley, seated, in embroidered apron, with sons John Preston Wiley (1914-1998) and Harvey W. Wiley, Jr. (1912-1951), in sailor suits.